The nandina is planted from turning the accident as a history tree. From charm of turning accident for each food to from antiseptic effect of leaf paving leaf in raw fish etc.The medicine and the leaf of the antitussive are actually dried and it is used for the medicine etc. of gargle. The country of origin is China. This is a way though the cultivated species was made wild though it grows naturally in West Japan. It is a bush that is evergreen or half evergreen. It comes to have flooded a lot of thin trunks from stock origin in the shape of the tree. A usual tree is about 1m-3m. The leaf is lustrous in a dark green color. Moreover, there is an antiseptic action. The anthotaxy is extended from the top part of the stalk in early summer, and a small, white flower blooms. 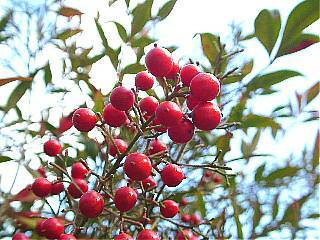 A red, small, round truth becomes about late autumn - early winter. There is the white truth named [shironanten], too. It is a tree often planted as a garden tree. A stock, a leaf, bark, and true Hitoshi have the poison fang. The medicine and the leaf of the antitussive are actually dried and it is used for the medicine etc. of gargle. It is the truth with a red nandina (berberis department nandina belonging). Because there is toxicity on the leaf, and is an antiseptic effect, it is likely to affix to the special New Year's food, the steamed rice with red beans, and the raw fish and to use it. It actually makes it to the medicine of the antitussive. The leaf is dried and it is used for gargle etc. It seems that the etymology of nandina has come from "The difficulty is changed". Therefore, it makes to the garden tree as a history tree, and it is planted well the door ahead. There are use often to cook, and a meaning of changing the accident of food poisoning, too.